St. Augustine Nights of Lights: 3 million reasons to check it out! Historic St. Augustine’s 25th Annual Nights of Lights kicks off on Saturday, November 17, when the city turns on its 3 million twinkling lights to spread holiday cheer throughout the Oldest City! Don’t miss Flagler College and the Lightner Museum, which are known for their especially spectacular displays. Lights continue throughout the Plaza de la Constitución, which also features a large Christmas tree. Saturday’s festivities start with live music at 4 p.m. outside the Lightner Museum, followed by a special performance by the All Star Orchestra in the Plaza de la Constitución at 5:30 p.m. At 6:30 p.m., the big countdown begins to light the tree and all 3 million lights around town. Live music continues until 8 p.m.
Free admission to local museums on Smithsonian Museum Day! 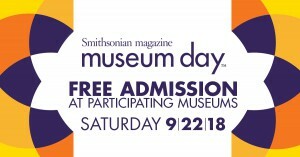 Smithsonian magazine is hosting a nationwide celebration of museums on Saturday, September 22! The organization is partnering with more than 1,250 museums and cultural institutions around the U.S. to offer free general admission. Just go to the Museum Day site, select your museum of choice, and provide your name and email address. Your ticket will arrive in your email inbox. According to the website, a ticket is good for free general admission for two people on Museum Day. Summer is full of fun, exciting outdoor activities. But, when the temperature heats up and the sun beats down, St. Augustinians find themselves ready to head inside and beat the heat. 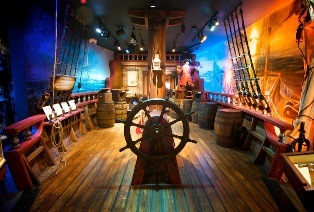 If you are in search of things to do inside, here are some fun, air conditioned destinations around St. Augustine.